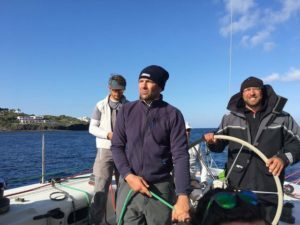 Hello there, I’m Marco, 42 years old, a professional skipper for the last 13 years, and a passionate sailor for the last 25 years. 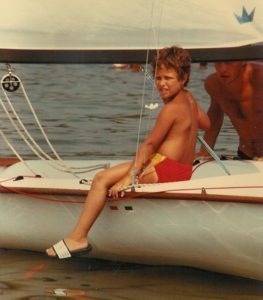 Coming from a family of lovers of the sea, I started to be a fan of sailing already as a boy. Growing up I put sailing aside for a few years to dedicate myself to another great passion thanks to my grandfather: the motorsports. I have enjoyed myself for several years in motorbikes and car races and to earn a living I worked in different sectors as a trading agent. Nevertheless, I never stopped cultivating the love for the sea by acquiring various sailing and scuba diving licences. Finally, the call of the open sea and the vision of an unlimited journey, brings me back to reality, that is, to my new reality. I totally return to my element – the sea and the wind. Started as many, with the first sailing holidays. As my senses awakened, I decided that this must be my life – the travel, meeting interesting people as well as a return to a simple and wonderful everyday life. I wanted to regain my spirit. It is the closure of my “circle” of life. I sailed for about 80,000+ nm of sea and did a lot of kilometeres on unexplored lands. 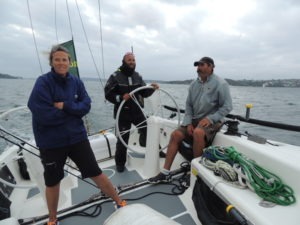 I completed many different navigations, including one unforgettable journey of two years from Italy to Australia on my boat Beneteau First 456, exploring Greece, Egypt, Sudan, Eritrea, Yemen, Oman, India, Thailand, Malaysia, Indonesia, Papua New Guinea and finally Australia. One of my favorite places to cruise is still the Mediterranean Sea. There are so many beautiful islands and amazing coastlines. I had the pleasure to visit the unique Aeolian islands many times, just like the wild Corsica, the stunning north Sardinia and many small islands along the way. The sparkling French riviera is like my second home and I always love to return to the splendid Greece, along with the Croatian islands, the Balearic Islands and the coast from Barcelona to Gibraltar. 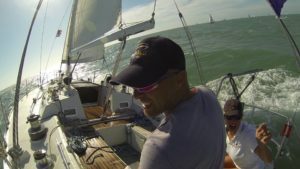 In my spare time I participate in different regattas around the world, to improve my sailing skills more and more. 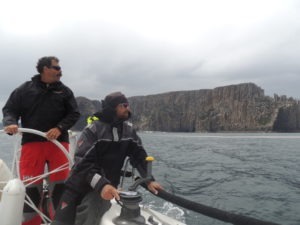 There is always something new to learn in the nautical world, it’s a school that never stops. At the same time in the recent years I have earned several international licenses and security courses , which allow me to work anywhere in the world. And then …. it could take forever to write everything down, I’d much rather tell you the beautiful and fun stories in person on board of MAD MAX! It’s been 4 years since I met my partner Baja, on a little island Gili Air in Indonesia. From that moment we did a lot of nautical miles and kilometres on land together and as of August 2016 we are proud parents of our son Maximilian. Baja has travelled around the world as a tour guide and a tour driver for 15 years. She lived in various countries on different continents, speaks 7 languages and loves all kinds of sports. Now she is a full time mama, helping me whenever she can with administration and backstage preparations. 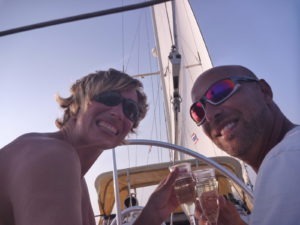 Come and join us to have the time of your life and become a SAILTRAVELLERS ! La Lunga Bolina 2017 (Open 60) Tyr.+transf. 3 Golfi Week Rolex 2017 (Open 60) Tyr.+transf. Cyclops Route 2017 1° place(Open 60) Tyr.